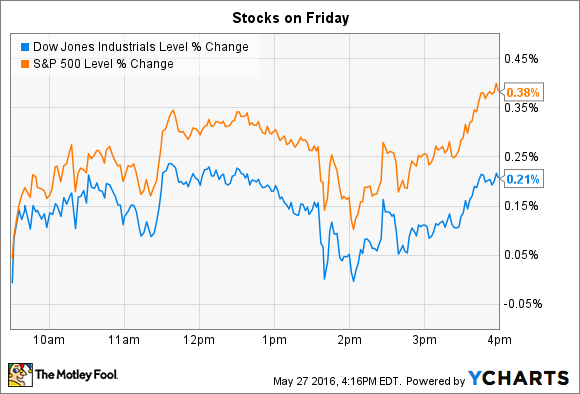 Find out why these two stocks broke away from broader indexes on Friday. After trading sideways for most of the session on Friday, stocks picked up in the afternoon to end with solid gains heading into the long weekend. The Dow Jones Industrial Average (DJINDICES:^DJI) gained 45 points or 0.2%, and the S&P 500 (SNPINDEX:^GSPC) added 9 points, or 0.4%. Both indexes rose by better than 2% for the week and are nearing year-to-date highs. In economic news, the government revised its estimate of first-quarter GDP up to 0.8% from the prior 0.5% estimate, meaning the economy only suffered a minor slowdown from Q4's 1.4% growth pace. Also, Federal Reserve Chair Janet Yellen said in a speech on Friday, that an interest rate increase would be appropriate if economic data continued to show improvements. The Fed could next raise rates after its policy meeting that concludes on Jun. 15. As for individual stock movers, investors sent Ulta Beauty (NASDAQ:ULTA) and Palo Alto Networks (NYSE:PANW) swinging on Friday. Ulta Beauty's stock rose 9% to reach a new all-time high after the beauty retailer announced strong first-quarter results. The company's 15% jump in comparable-store sales trounced management's 10% forecast and marked its fastest growth since going public in 2007. Ulta is soaking up market share with help from a salon setup that helps differentiate it from competing retailers. In addition, CEO Mary Dillon credited "healthy consumer demand in the beauty category," for pushing results higher. "We are off to a phenomenal start to the year," Dillon said in a press release . Profitability improved as gross profit margin rose by almost 2 percentage points to reach 36% of sales. Meanwhile, the higher revenue base helped expenses drop as a percentage of sales. Thanks to those two positive trends, net income soared 37% higher to $92 million. Ulta ratcheted up its sales growth forecast for the year and now sees comps growing by 11% at the midpoint of guidance, compared to the 9% it projected back in March. That target seems achievable as customer traffic is currently growing by double-digits. Ulta also expects to add roughly 100 stores to its footprint in 2016, which puts it on pace to grow sales by at least 20%, overall. Palo Alto Networks sank 12% following quarterly earnings results that beat expectations but also included conservative guidance for the coming quarter. The cyber-security software specialist grew sales by nearly 50%, beating management's forecast thanks to over 60% higher billings. However, surging costs, especially on R&D and marketing, drove a significantly higher loss for the period. Palo Alto produced a $70 million net loss, compared to $46 million a year ago. Executives believe those investments, in R&D and marketing, are worth it because they help the company build a strong client base. "Robust new customer additions and expansion in existing accounts resulted in market-leading, year-over-year growth as customers increased their investments in our Next-Generation Security Platform," Chief Financial officer Steffan Tomlinson said in a press release. That growth pace is projected to decrease in the current quarter. Management said that current market conditions point to revenue improving by 37%, for a marked deceleration from this quarter's 48% jump. Considering the company isn't producing any meaningful profits, it makes sense that the stock would retreat following indications of slowing sales growth.